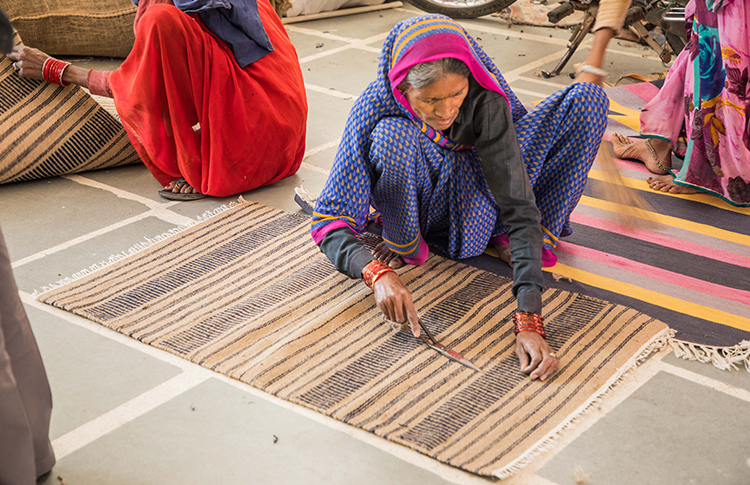 A lover of aesthetic interiors that I am, the colourful chic rugs caught my eye on the very first day, and whenVikram, our Interior Designer, mentioned that they were hand-weaved and by a women-centric organisation, it further piqued my curiosity. Sutra Designs is known for its expertise in “hand-made” interiors, and holds a long association with Vimla International. “It was my interest in hand-woven art that first steered me to Vimla International, and with time I saw the bond growing stronger since we not only hold common brand value, but also a mutual inclination for local art and artisans”, shared Vikram Singh, Founder Designer, Sutra Designs. A December winter morning and you get to go for a drive to the city outskirts on work, couldn’t get better, right? 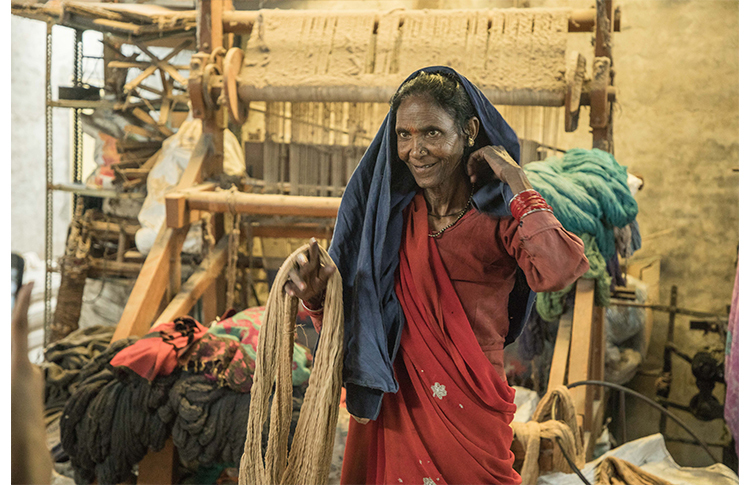 So we set out towards Amber Road for Banskho Village, the native place of the owners, also the location of their factory, and an hour-and-a-half later, the pleasant sun-filled ride came to a halt at the beautiful Vimla Rugs’ factory. At the entrance of which, Mr. Dinesh Jain, co-owner and the younger of the two founder brothers, stood for our welcome. With our eyes still hooked to the beautiful painting of a typical village afternoon, we stepped inside the haveli-like factory, and the beautiful blue-pottery-esque jharokas of the main hall lit our eyes brighter. Still absorbing, we noticed that the hall had multiple exit door, behind which hid the intriguing rug-weaving world. Excited and curious, we wondered where to head first, and right then Mr. Dinesh led us to the other end where the women sat working on the trimming of carpets. 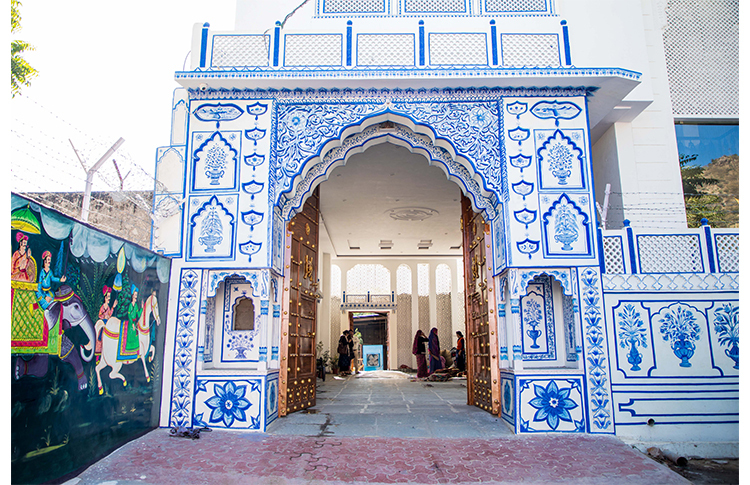 Arihant Arts, also popular by the name of Vimla International, was started by the two brothers, Kamlesh Jain and Dinesh Jain. And today after 30 years, the brand stands as one of the most recognised Best rugs Kmanufacturers of India, and is also amongst the very few companies that make of hand-woven rugs. “Long before we stepped into this industry, there lived a man in our village, who attained the popularity of being known as a weaver. Well-versed in the skill, he had come to Banskho from an outside land, and trained people here. Villagers say that had he not let alcohol over-power his life, he would have proved to be a very talented artisan. But with time, he lost it all, and left the village, too. 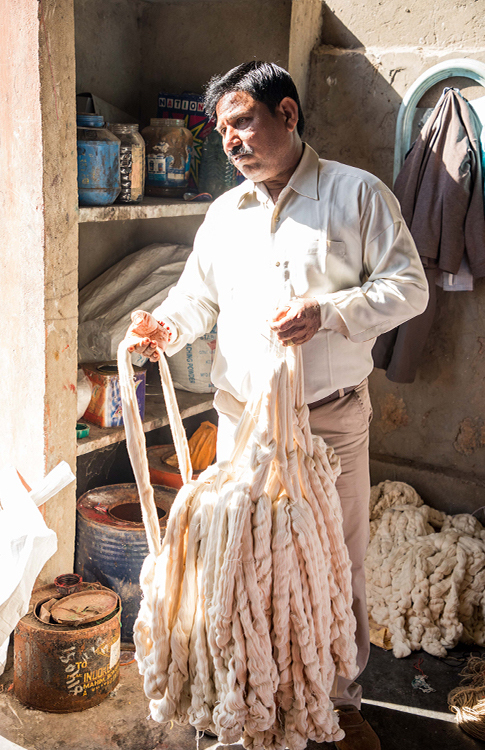 It was many years later that we decided to try our hands at rug-making, time went slow but we continued to take small steps, and gradually more people got involved and it came out successful,” Mr. Dinesh shared. Tell us about the beginning, what inspired the initial rug designs? 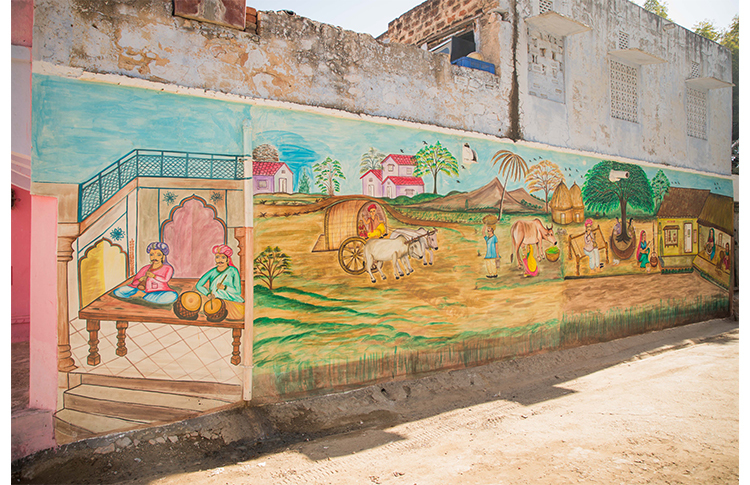 When we started, all we had were our own ideas, and some of the artisans helped us, too. And gradually we hired people for it. Now there is a team of designers who work on the design ideas, though mostly we try to derive it out of the clients’ demand. At what point did you decide to employ women in your team? And how did you train them? We initially had men of our village working with us, then more from the nearby villages joined, and consequently we got the idea of employing women. They often used to accompany their husbands sometimes, and many of them were already aware of weaving and threading. Our old employers helped them train, and we even have government-aided orientation programs. So how many women are currently working? Do they all come to the factory and work? Today we have a team of over 190 employees, and more than 90 of them are women. Women of Banskho and nearby villages come here to the factory, but there are a total of 90 villages that are a part of Vimla International, and since they can’t travel from far, we have installed smaller units for every group of few villages. Also, sometimes women take the carpets home to do the finishing work from there. Would you give us a quick glimpse of the steps that go into the process before we proceed to witness them? The first step after having received the basic thread (loom) is to wash it in chemical water that helps soften it. We get different thread looms (he moved ahead and picked a loom), this one here is cotton, amongst others, you will find silk, jute, and woolen looms. Next step is to soak it in normal water, to get the chemical off it, followed by dyeing and drying. Once dried, it is sent for threading, and thereafter to the loom stands for its final weaving into a rug. The last step being the finishing. And at which stage are women involved? Except for dyeing and washing, women handle all the other stages. Ah! How do you ensure a better livelihood for their family? So we have made their bank and PF accounts, and we make sure their salary goes directly into their own accounts, which makes it easier for them to manage their earning and expenditure, and also in the times of need of a loan. There has come a significant change in their lives, in terms of independence and self-sufficiency, and though each of their situation differs, the happy pride and satisfaction of working and earning are evident on their faces. Is your own family involved in the business, too? Oh yes, they are! My elder brother’s son and mine have taken the charge of the marketing, exports, and other departments. Your daughters, I asked? My elder daughter has recently joined us in the factory. And before we could ask him to introduce us to his daughter, Harshita (Dinesh Ji’s daughter) walked in. A textile designer, she graduated from Polytechnic University last year and joined the family business. But unlike her cousins, she looks after the processing at the factory and lives in Banskho itself. 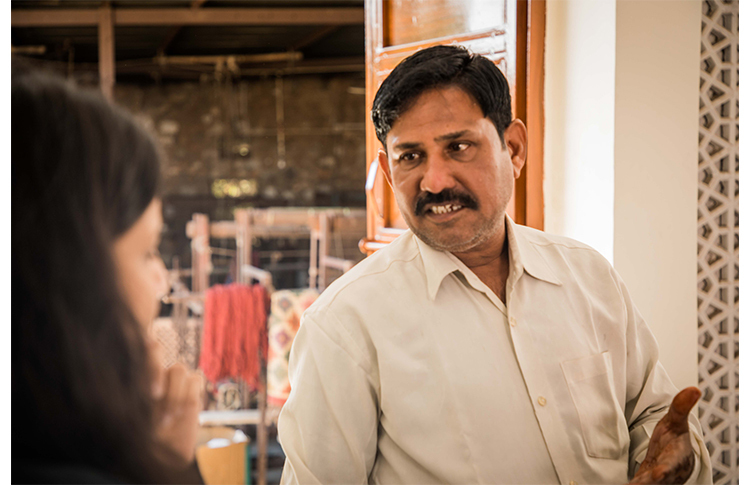 Needless to mention, it was Harshita who then, along with her father, took us around the factory and guided us through the procedures (more on it in the following articles). 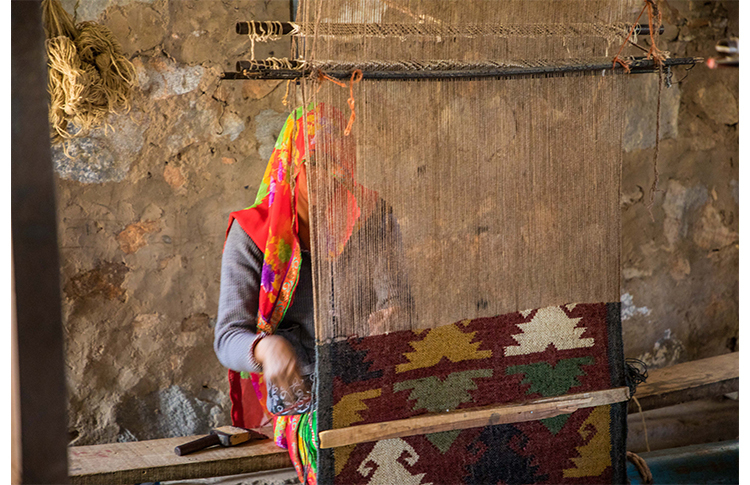 Oh and she even introduced us to Kesar Amma, a pro rug-weaver, and one of their oldest employees. And as I write, her smiling face flashes in front of my eyes, and not to forget her words, “may no one ever see the time I did in my life” still echo in my ears. Stay tuned for her story!